Ride all day, eat all night, and make new friends in between. That would sum up our bike trip through Puglia, a little known region of Italy, famous for its olive trees and Trullo houses. And with 5-7 hours spent on a bike daily, helped only by padded shorts, padded seat and the promise of the spa or bar at the end, my mind strayed to areas I thought I left home. One night we learned to make pasta before enjoying another wonderful dinner. The wine flowed freely and the bus ride back was ripe for bawdy banter. Trip leader Tony pegged my husband Saul as the great font of jokes. He wasn’t wrong and soon we were all laughing. The more off-color, the better. No one seemed offended, and the group gelled further. And then, in a rare moment of needing to share, I told the group a story. Once upon a time, in OR #6, where I spent every Tuesday and Thursday for nearly 30 years, our room was comedy club was #1, a main stage for would be comedians. Off-color, ethnic, and silly–all were welcome. I cannot tell a joke so my job was to laugh, which I would over and over again, even if I heard the joke before. That was why my room was so popular. Everyone laughed and no one took offense that I could recall. Bob Kaye, an anesthesiologist, had the best jokes–he made up the Linda Brodsky series which made fun of me and my ways. At those I laughed the hardest. And then started the era of political correctness. And the jokes stopped. People became afraid to talk. To get personal. To offend. 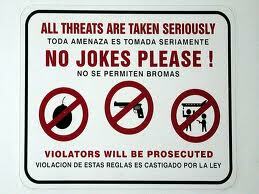 To release tension through humor. And believe me there is always tension in an OR as there should be because tension keeps you on your toes. This is good tension. The good tension has been replaced with bad tension. And this kind of tension is a direct result of the age of political correctness. It has gone too far. There is no good way to release the bad tension. So tension started coming out in the form of “anger” and people started to have anger management problems. Oh, dear. Take away a healthy release valve and what do you have left? A lot of politically correct, unconnected people by a bond of laughing at ourselves and our world. Humor didn’t disappear in the concentration camps. Why did it disappear from the operating room? Letting off steam in healthy ways was replaced by more unhealthy ways. Of all the “revelations” I had on this bike ride, this was perhaps one of the most important. The culture of an OR is unique and the surgeon is ultimately responsible. Teamwork helps, but let’s face it, not everyone on the team is created equal–not in investment in the cause, not in skills, talents, knowledge, and not in responsibility. Record keeping on computers has taken skilled nurses out of the loop of patient care. Check lists have gone wild. Kafkaesque like situations are taken as ho-hum normal. Okay, throwing instruments or dirty sponges at nurses is not going to illicit a positive response, but how many times do I have to be handed the same dull scissor that won’t cut at a crucial moment before I am supposed to get more than a little annoyed? Whose fault? No one’s, of course! The scrub tech isn’t responsible for the instruments. The circulating nurse told them to sharpen all the trays and replace dull instruments. Central supply staff couldn’t tell which ones were dull. The OR director put in a request for new instruments but had not had a response. I think you get my drift. Everyone is responsible, and therefore no one is responsible. A good OR looks like a well-performed ballet. There is tension and then there is release. We need to stop being so politically correct and once more begin to find healthy ways to release. My vote is to bring back the jokes and the stories. The End. This entry was posted in Anger Management, Ask Linda, Uncategorized and tagged Anger Management, Political correctness. Bookmark the permalink. Post a comment or leave a trackback: Trackback URL.